I know you can have some makes of micro rice which are quite low in syns but this was just one I had at back of cupboard it does have added oil so guessing it will be quite high, can someone work the syns for me please. Can you give me the brand? I can get you more accurate syns. And to be honest, they've all got oil in them, hence why they have a syn value. It depends on flavours, but Uncle Bens and Tilda are pretty good. Between 1-4.5 syns per pouch. Plain ones I always go for Uncle Bens Basmati at 1 syn per pouch. Flavoured differs. Tilda Sundried tomato (2.5 syns) and Sweet chilli & Lime (2 syns) are my favourites. Tilda do a Mexican chilli & bean rice at 2.5 syns. The Uncle bens Mexican one is 3 syns. 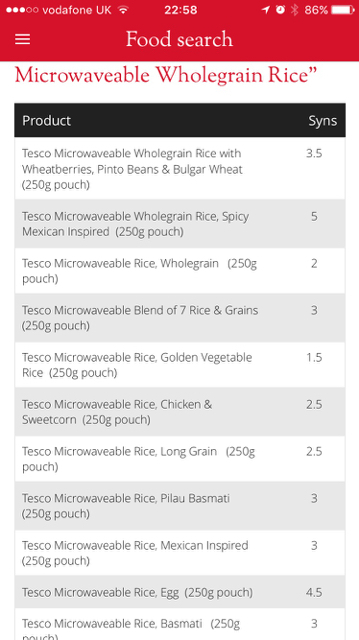 How many syns in a Tesco microwave wholegrain rice pouch please? Find more posts on mexican, rice.